When you are looking at Texas Hill Country Real Estate, one of your main concerns is going to be water. Aquifers and water sources for Fredericksburg TX and Gillespie County. If you are looking at small acreage with homes for sale or large land and ranches for sale in the Fredericksburg TX area, then you will need water! Whether it is for livestock, for any crops you plan on growing, or for your home. Fortunately Fredericksburg TX and Gillespie county is blessed with good water sources. Cretaceous age Edwards aquifer within Gillespie County is comprised of limestone and dolomite. That is an extension of the Edwards Plateau into Gillespie County from the west. Yields from the Edwards are generally low (10-20 gpm) and it is used primarily for rural domestic and livestock demands. Recharge is from local precipitation which occurs on the outcrop. The Ellenberger is a fractured limestone and dolomite and is present in the southeastern and northwestern portions of the county. It is absent in a broad area extending from the north central portion of the county continuing to the south, southwest part of Gillespie County. This is a faulted uplifted area where the Ellenburger and other older Paleozoic rocks were eroded prior to Cretaceous sea transgression and subsequent Hensel deposition. The area is termed “the Fredericksburg High” in the TWDB Report 339 “Evaluation of the Groundwater Resources of the Paleozoic and Cretaceous Aquifers in the Hill Country of Central Texas”. 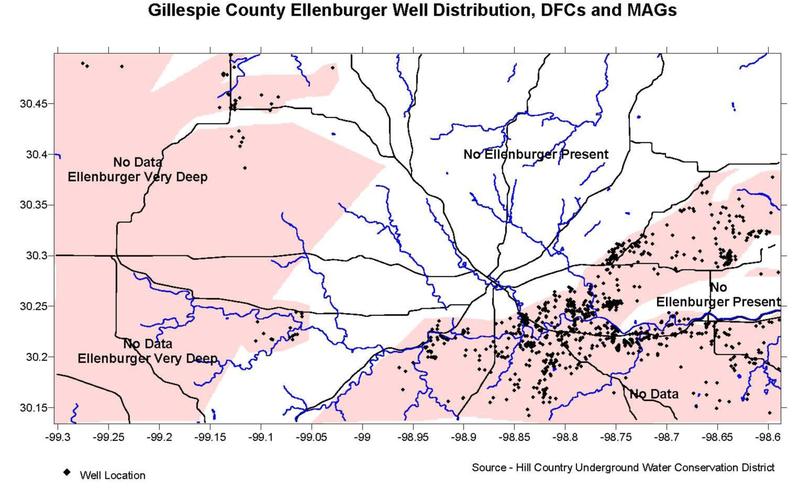 In some areas significant cavity development has occurred within the Ellenburger resulting in it being able to produce very large amounts of groundwater (>500 gpm) in some locations. It is utilized extensively by the City of Fredericksburg and many peach and grape growers in Gillespie County. Recharge to the Ellenburger is mainly through the overlying Hensel. is comprised of sand, and like the Hensel, it extends across much of Gillespie County except across the northern border where it has been eroded. Although it is extensive in area, it only produces groundwater along the above mentioned Fredericksburg High. Along the Fredericksburg High yields from the Hickory vary from very low (5 gpm) to good (>100 gpm). The City of Fredericksburg has three municipal wells completed in the Hickory. In the Eckert area the Hickory is used to drip irrigate grapes that are grown on the Hickory outcrop. 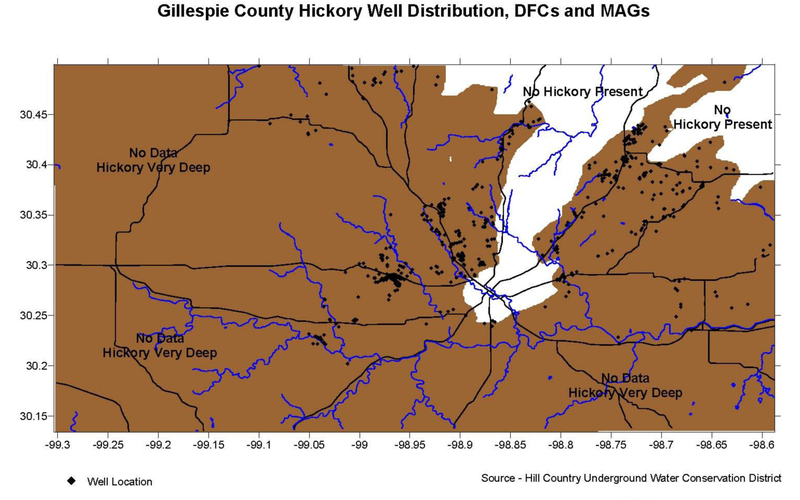 Recharge to the Hickory occurs from local precipitation on its outcrop in northeastern Gillespie County and through the overlying units, where it is in the subsurface. Comprised primarily of sand with secondary amounts of clay and silt. Extending across the majority of Gillespie County, except along the northern border and the northeastern sector of the county where it has been eroded. The Hensel outcrops in the Pedernales River Valley, but it is in the subsurface where the Edwards Plateau is present. Yields from the Hensel are generally 10 to 20 gpm and used for rural domestic and livestock demands. Some drip irrigation occurs from the Hensel for peaches and vegetables. It is recharged from local precipitation on its outcrop and through the overlying units where it is in the subsurface. 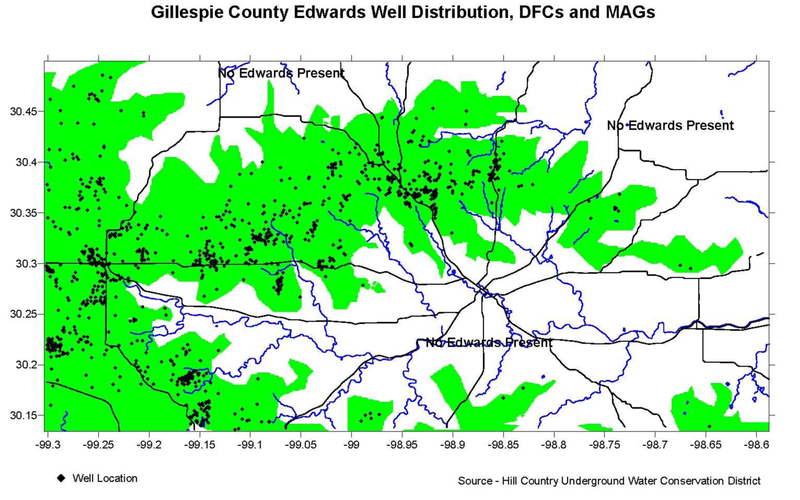 Some of the rocks from the Cambrian are aquifers on a very local basis within Gillespie County. These include the San Saba and Welge of the Wilbers formation and the Cap Mountain of the Riley Formation. The Welge is a sandstone and yields from it are generally low (<20 gpm). The San Saba and Cap Mountain are both carbonates which also produce generally low yields, however if significant fracturing is present water yields can be very high (>100 gpm). The Precambrian age rocks are for the most part not aquifers, however in a few local areas long the northern edge of the County, some of the granites produce very small amounts of water (<5 gpm). Thanks to the Hill Country Underground water District for the information provided here.